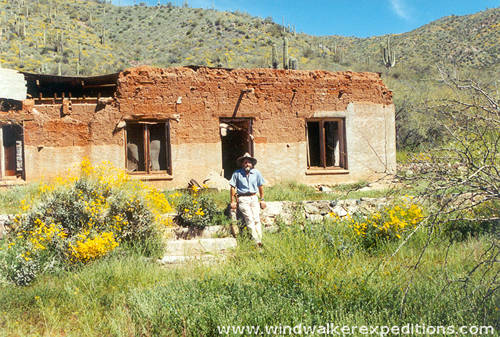 Visit Humbug a historic gold mine at the base of the Bradshaw Mountains. You'll see the homesteads and grave sites of the first settlers who found gold in this area in the late 1800's. 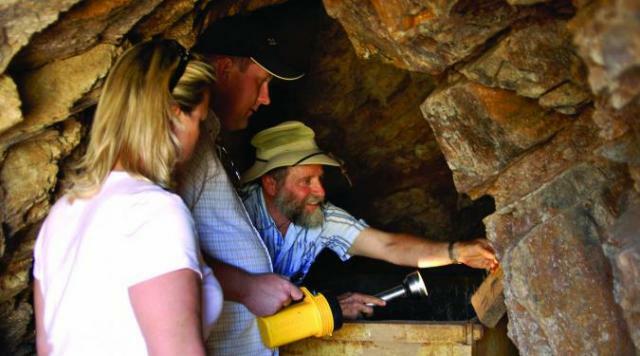 While working along side an experienced prospector, you will hear some well told stories, learn about the geology unique to the area, pan for gold and keep what you find. Then just a mile or so up an old wagon road we can investigate a 500 foot long mine tunnel known as the Pero Bonito Mine, complete with ore cart and tracks. 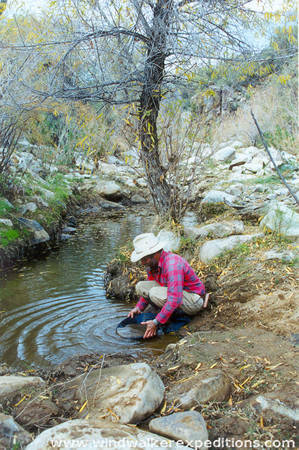 Humbug Creek seems to have been named by prospectors who had heard rumors of great treasure in the southern Bradshaw Mountains but had found little or nothing at all and so dubbed the place a "humbug." 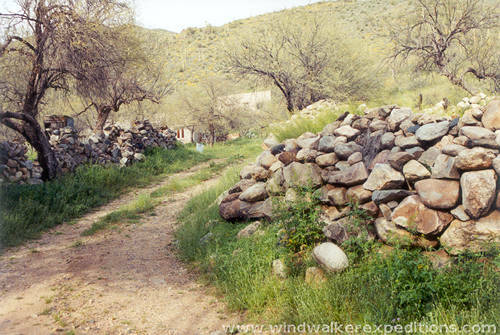 A Prospector named Charles Champie and his family arrived at Humbug and opened a claim he named Llano. He excavated a shaft and a tunnel, built two stone houses, a millsite, a well and a smelting furnace. The Llano workings produced about 2000 ounces of gold. Moving about a mile to the east, he opened another claim he called the Sidewinder and recovered about 1000 ounces of gold. From the Sidewinder claim Charles moved south and opened what is known today as the El Pero Bonito which produced over 5000 ounces of gold. Champie & Co. left Humbug and moved about two miles south to Columbia, where he continued gold mining and milling in Swilling Gulch along side Humbug Creek. Here he built a steam powered mill, the remnants of the boiler can still be seen today by the banks of Humbug Creek. With the fruits of his labor in hand and a dream of owning a ranch in his head, Charles moved to French Creek to realize his dream. The Champie Ranch and the small community of Champie, AZ are still in operation today, though the Champie family lost the ranch during the great depression. Pat Fogarty was living and mining at Humbug when Frank Hyde, a wealthy easterner was looking to invest in gold mining. They formed a partnership, with Hyde supplying the operation with a substantial infusion of capital. Frank built a half dozen new buildings, including miner's quarters, a mess hall, an assay office, a cottage for Pat Fogarty who was getting old and a large house for Frank and his family. Pat Fogarty's grave site can be seen at the Humbug cemetery. Hyde's mining operation was not sufficient to cover expenses but they did uncover a pocket of gold in a claim called the "Little Annie" that produced about a thousand ounces. Mining was discontinued at humbug in 1935. Newt White came to work for Frank Hyde about 1940 having worked for many years at the Champie Ranch as a cowboy, wrangler, mechanic, etc. He stayed on at Humbug as caretaker after Hyde moved to Tucson in the 1950's. Newt died in 1997 and is buried next to Pat Fogarty in the Humbug cemetery.